by Adrien "CaYuS" Toupet, Clément Delatre & Looky. Georges Méliès School / EESA - Promo 2008. La Main des Maîtres will be screened off competition at Fantasy en Beaujolais on the week-end of the 14th of November, 2015 next to Mâcon (France). Six years after its release, La Main des Maîtres is back on the big screen. It will be screened off competition at the Halliennales on October 11st, 2014 near Lille (France). It will also be possible to watch it in competition for the 11th edition of Court Métrange in Rennes (France) from the 16th to the 19th of October, 2014. Curtocircuito will organise a steampunk event named "Extraordinaire Uchronie" in Santiago de Compostela (Spain) where La Main des Maîtres will be screened on the 7th of May, 2011. On the 29th of January, 2011, La Main des Maîtres will be screened at Anime Max – Stage 4, hosted by Comic’s Kingdom at the Macau Cultural Center (China). On the 22nd of October, 2010, La Main des Maîtres will be screened in competition during the "Science-Fiction and Fantastic" program of SPASM Festival in Quebec, Canada. La Main des Maîtres will be part of the European screening off competition during the Busan International Short Film Festival (South Korea), from the 12th to the 16th of May, 2010. La Main des Maîtres has been screened this week in Guadeloupe during Caribulles festival. It will also be part of the short film competition at Melbourne International Animation Festival (19th to 27th of June, 2010 - Australia). La Main des Maîtres is now part of the compilation SFF-rated DVD 2006-2009. La Main des Maîtres won the Deffie Award for Best HD Animation and the Deffie Award for Best Foreign HD Animation at the last HDFest (USA). In the next weeks, La Main des Maîtres will be screened in different cities of South America thanks to Animarte festival. By the way, the short film came 3rd in the computer animation category of ComputerSpace (Bulgaria). A few days ago, La Main des Maîtres was in compétition at Kinofest festival (October 22nd/24th - Romania), and it will also be part of the competition of Science+Fiction festival (November 22nd/28th 2009 - Italy). Recently, La Main des Maîtres was selected at ArtFutura Show (October 29th/November 1st 2009 - Spain), at Imaginaria Film Festival (November 11st/15th 2009 - Italy), and also at ComputerSpace festival (October 29th/31st 2009 - Bulgaria). With all your votes, La Main des Maîtres won the 2nd price at Bitfilm 09 (Israel), category "Best Animation". Thank you for your support ! To read, an article about La Main des Maîtres in the chinese magazine CGMagazine (October 2009). La Main des Maîtres won the Best Animation award at the last Strasbourg Intarnational Film Festival (France). Stash Magazine n° 60 now available; the 5th anniversary issue featuring great music videos, commercials... and short films including La Main des Maîtres. The short film will be screened in competition at the next Lille International Short Film Festival (France), held from October 6th to 11st, 2009. From August 28th to September 6th, 2009, La Main des Maîtres will be screened in competition at Strasbourg International Film Festival. Also in competition at HDFest New York, tenth year anniversary of the festival held in the Sony Wonder Technology Lab Theatre (October 20th and 21th, 2009). The short film will be part of a special program of Eksjo Animation Festival in Sweden, where it will be screened off competition from September 24th to 26th, 2009. Thank you so much to Sarah Slee for her article in the english magazine 3D Artist n°5 (August 2009). La Main des Maîtres will be showcased at GameX (Philadelphia, USA) from October 23rd to 25th, 2009. The short will be screened in competition at Tours Métrages (Tours, France) from September 3rd to 6th, 2009. It will also be part of the SESIFF (Seoul, South Korea) from September 23rd to 27th, 2009. La Main des Maîtres is currently, and until July 29th, in competition at Fantasia 2009 (Montreal, Quebec). La Main des Maîtres has been nominated for a Bitfilm 09 award. Closing event will be held in Tel Aviv (Israel) on October 1st, 2009. Annecy International Animation Film Festival is held this week in France. Thank you Telerama and Le Figaro for writing a news about La Main des Maîtres, currently in competition at the festival. One June 20th and 21st, 2009, the short film will also be screened off competition at Bulles Zik festival (France). This week, La Main des Maîtres was screened in competition at Festimaj festival (France). To read on Side Effects website, an article about the use of Houdini in La Main des Maîtres. Many thanks to the whole SESI team for their support ! La Main des Maîtres will be screened in competition at 37th Festival of Nations (Austria) from June 14th to 20th, 2009. La Main des Maîtres is currently screened in competition at Animayo'09 (Gran Canaria). The festival is held from May 23rd to May 30th, 2009. La Main des Maîtres will be screened in competition at CrankCookieShortfilmdays (Germany) from June 24th to 28th, 2009. Paris ACM Siggraph show will be held on May 28th, 2009, from 7 to 10PM in Atelier BNP Paribas, 5 av Kléber, Paris (France); the occasion to celebrate french projects selected at next Siggraph. La Main des Maîtres will also be on the Siggraph Video Review 2009. La Main des Maîtres won first place in animation section at SkyFest 2008 (USA). The short film was also in competition at Bobin'Lille (France) on April 15th, 2009. After Annecy, La Main des Maîtres will be in competition at the Computer Animation Festival of the famous Siggraph, held this year on August 3rd to 7th, 2009, in New Orleans (USA). Andy Price for 3D World recently offered us a two pages article in English. 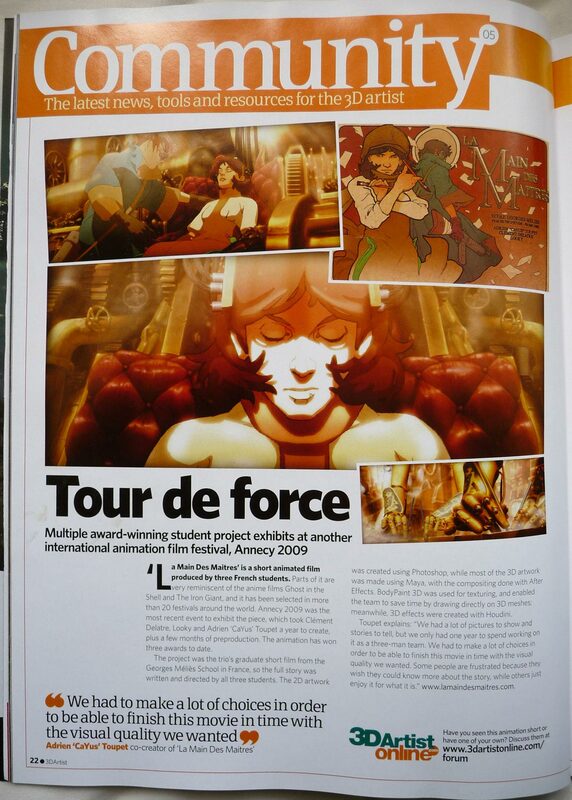 To read in the showreel section of the magazine 3D World n°116 (April 2009). Website is now available in English and French. La Main des Maîtres will be screened in competition at Annecy International Animation Film Festival (France) from June 8th to 13th, 2009. Meanwhile, il will also be screened in competition at 3rd Festival du Film Court de Castres (France) from April 22nd to 26th, 2009. During Monstra Festival (Portugal), La Main des Maîtres will be screened in the movie theater Sao Jorge on Saturday 14th March 2009. From April 24th to 26th, 2009, the short film will also be in competition at Festival International des Très Courts (France). From March 4th to 8th, 2009, La Main des Maîtres will be in competition at Zlin Dog festival (Czech Republic). It will also be in competition at Festival Trolls & Légendes (Belgium) from April 10th to 12th, 2009. La Main des Maîtres will return to Belgium where it will be in competition at Brussels International Fantasy Film Festival from April 9th to 21st, 2009. From March 19th to 27th, 2009, La Main des Maîtres will be in competition at Roma Independent Film Festival (Italy). Screenings will be held in the Nuovo Cinema Aquila de Roma. Doing its around the world trip, La Main des Maîtres was in competition at Videologia Festival (Russia) on 20th December 2008. The short will also be in competition at Athens International Sci-Fi & Fantasy Film Festival (Greece) from March 12th to 18th, 2009, and at Festival Vidéo d'Orléans (France) from March 10th to 13th, 2009. Each year, the famous Visual Effets Society rewards the world best visual effects. This year, La Main des Maitres is honored to be nominated as "Outstanding Effects in a Student Project".VES Awards ceremony will be held in Los Angeles on February 21th, 2009. Back in France, the short film will be screened at Bègles on Saturday 21th March, 2009, 9PM, during Cinéma Le Festival. 3ème Salon du Cinéma will be held on January 16th to 18th, 2009, in the Grande Halle of La Villette. We will do a conference about La Main des Maîtres on Sunday 18th, 11AM to 12:30AM, in the ampithéâtre Georges Lucas. Again, a big thank you to Dailymotion which keep supporting us, putting us again on their homepage with the Best Of Dailymotion. A new year starting with Anima festival (Belgium) from February 20th to 28th, 2009, where La Main des Maîtres will be in competition. Starting today, until December 16th, 2008, the 18e semaine du film d'Animation de Tournus (France) will screen in competition La Main des Maîtres. As a reminder, we are currently participating in aniBoom Awards 2008. Feel free to get a peek at it and vote for your favorite animation. Meanwhile, Dailymotion organizes a screening at Cinéma des Cinéastes on Saturday 6th December, 2008, 12AM (Metro Clichy, Paris, France - 4 €). We were invited there to screen La Main des Maîtres. Again, thank you Dailymotion for their support! Sylvain T. for Scifi-Universe spent a while with us to write an interview. Thank you to him and all SFU Team! CGArena team honored us with our first interview in English. Thank you to them for their support ! Cor-10 Festival (Spain), rewarding innovations and visual improvement, has just selected La Main des Maîtres with eleven other projects. Festival will be held from December 1st to 3rd, 2008. La Main des Maîtres is currently participating in aniBoom Awards 2008, an online competition with public votes. Come back on December 15th, 2008, for the results. The short film was selected for the E-magiciens Best Of 2008 (France). It will be screened for the award ceremony of the festival on November 28th 2008, and we will be there ! La Main des Maîtres won Animation award at 9th TOTI festival (Slovenia). Screening and award ceremony at Maribor, on November 22nd, 2008. The short was selected at E-magiciens 2008 (France). It will be screened in competition from November 25th to 28th, 2008, as a student short film in the "Compil des Profs". Come and meet us at ParisFX (France) from November 19th to 20th, 2008. Stills of La Main des Maîtres will be published in the festival catalog, and the short will be screened. Of course, we will be there for the event. You can read a few forum topics about the short film with Questions / Answers on CGTalk (English), od[force] (English), and also BlenderClan (French). If you want to know more about origins and directing of La Main des Maîtres, you can read a french interview of us on 3DVF website. Thank you to them for their support ! Thank you to everyone who is posting news about the short film these days. There are Fous d'Anim, Catsuka, Koreus, 3DTotal... without forgetting Dailymotion which offered us their homepage for a few days. Moreover, you are a lot to share the news on your blogs, forums, websites... and we also received many e-mails and comments. In all cases, we are always happy to write you back. A big thank you to everybody ! It is official, website is open. You are now able to watch the short film in the website gallery. Thank you to everybody for your support (Science & Vie Junior, Effets-Speciaux.info, Ecran Fantastique, 3DVF...), and thank you to Georges Méliès school teachers to help us making this possible! La Main des Maîtres was announced on cover page of Science et Vie Junior n° 230 (November 2008). Moreover, a four pages article about the short film. You are now able to read Pascal Pinteau's interview on Effets-speciaux.info website. For its first public screening in movie theater, the short film is selected at Festival de Draguignan, where it will be in competition in HD movie section. Festival will be held from October 24th to 26th, 2008. Pascal Pinteau, for Ecran Fantastique, honored us with our first press interview. To read in the EFX supplement of September 2008 Ecran Fantastique. Website is being set up. It will be available on Friday 24th October, for the screening of La Main des Maîtres on Internet.